You kids have been so good this year, so I wanted to get you a present. But how do you shop for readers? The only thing we can give you is uproariously hilarious commentary and butter-knife-sharp wit and wisdom about Purdue athletics (and whatever else we have an opinion on) and we do that all the damn time. So to do something special, I decided to go back to one of our more popular (and definitely our most shallow) feature. Normally, as you'll fondly recall, SBF featured typically 3-4 young lasses in various poses. Well, this year-end edition as we head into the holiday week is a big bigger. It's grown longer, you see. Expanding in size and lengthening. If you catch my drift. And I think you do. Brady Quinn got it right away. Anyway, on we go... enjoy. These are two of the USC Song Girls. It's interesting that in a self-photo, they managed to cut off the tops of their heads but ensured their boobies made the frame. Well-done, ladies. This is Ashley Harkleroad, a tennis player. Or a plumber. I can't remember. I also imagine it's hard to play tennis in those heels. Hey, it's the USC Song Girls again! Crusing along a highway, taking pictures. Why didn't we go to school in California again? This is one of my old favorites, Denise Milani. All decked out in red for Christmas. This is the wife of brittle "NFL" quarterback Brady Croyle, Kelly Croyle. Isn't it interesting how if you or I were in this pose, it'd be a horrible picture (not looking, sort of blurry, eyes closed) but when Mrs. Croyle does it, it's wonderful? I don't know who this is, but she's seems to be dangerously close to a welding area without safety goggles. This is Suzanne Carlson. Do you even care? Now THAT'S a Sideboob photograph. When you need a yardstick to measure cleavage, it's been a good day. Just your typical Alabama football fan, dreaming of a national title that never came to pass. Marisa Miller lost her top in the rough surf, I think. Let's help her find it. It's uncanny -- it's like they follow me wherever I go. Completely random picture of a couple of blondes on a beach somewhere. 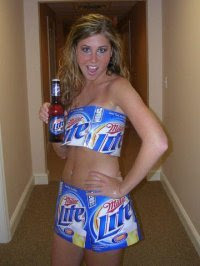 Suddenly I'm really thirsty for a Miller Lite. Anybody else? I mean, like, really thirsty. Another example of a SBF Hall of Fame quality pose. When you can see under the cleavage, it's either a great bra, a terrific shirt, or fake hooters. Or maybe all three. So hopefully this little display will help get you through the long cold week of family get-togethers, drinking egg nog with in-laws and whatever else you have planned. Thanks for supporting us all year long and we actually do genuinely wish you dudes (and dudettes -- I think a few chicks read us) a really happy holiday season. Sideboob Friday is a production of Boiled Sports and runs once in a while in this space. If you'd like to contribute to SBF or send in a photo of yourself posing for SBF, please feel free at BoiledSports@gmail.com. Unless you're a dude. Then just send pics of your girlfriend's rack.